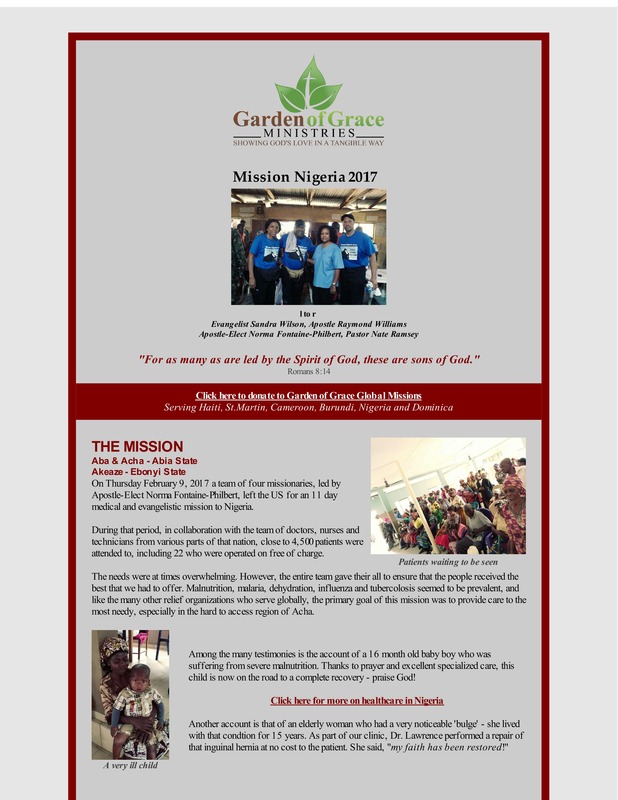 GARDEN OF GRACE MINISTRIES is dedicated to ensuring that every child in a rural, mountainous community of the Croix des Bouquets region receives a quality elementary education. We understand that knowledge provides open doors to success and therefore, it is our desire to afford as many students as we can the opportunity to obtain a basic education. We believe that no barrier should separate a child from learning the fundamentals of education - which is to read and write. 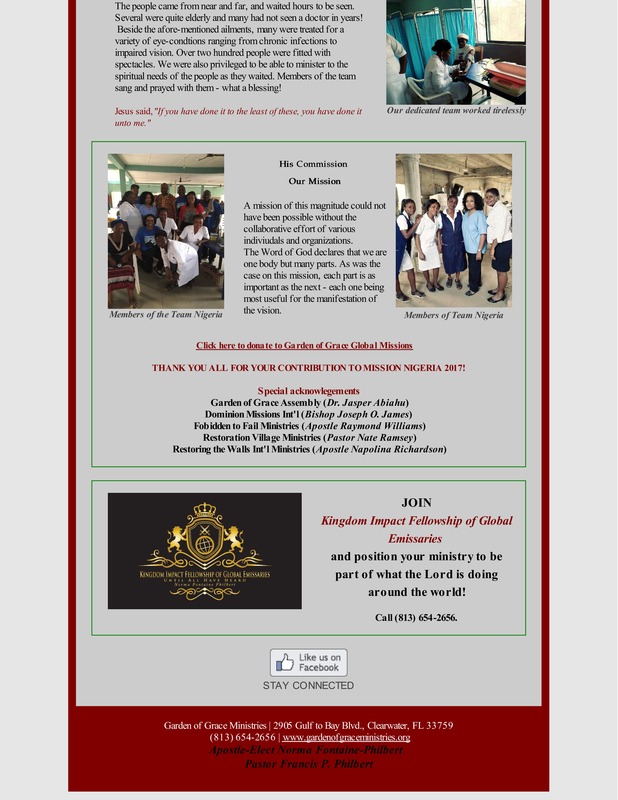 We are committed to instructional excellence and by God's grace, we accept the responsibility to create a learning environment conducive to optimum academic achievement. The Word of God is the basis of our curriculum. It is not simply the most important subject of instruction at this establishment, but it is the authoritative interpretation of all school subjects. There are presently 183 enrolled students, at the Institution Mixte Jardin de la Grace, each one receiving a hot meal every day. 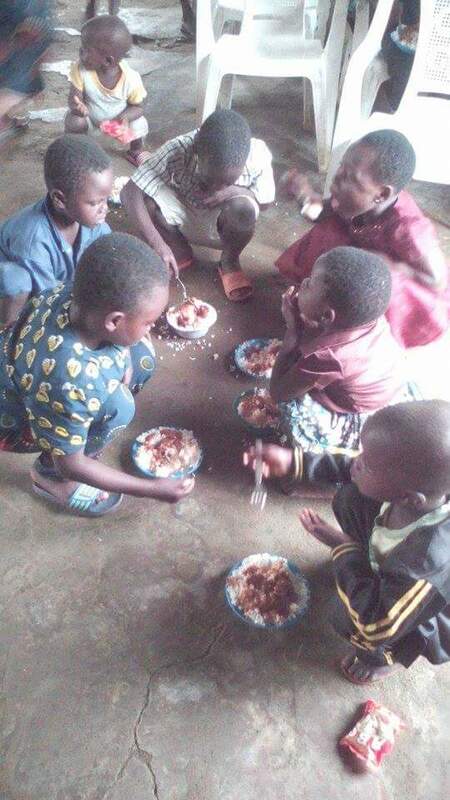 For some of our students, this meal is only full meal they will eat for the entire day and for all, this school is the only one they have ever attended. 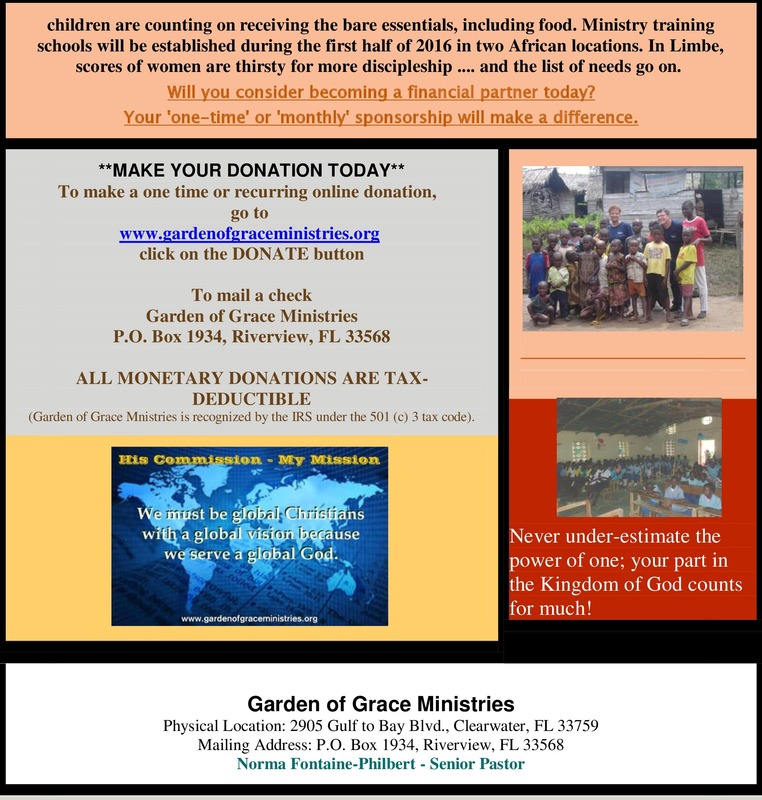 Our decision to engage in this effort reflects our desire to assist the neediest children in the nation of Haiti. 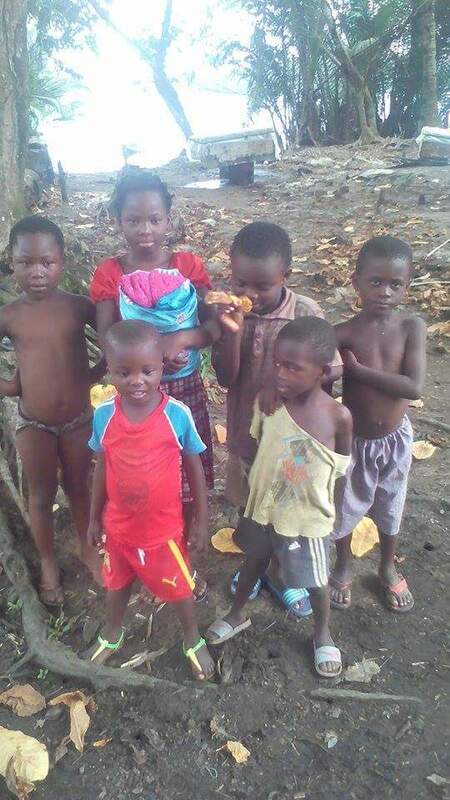 We care about the nation of Haiti by caring deeply about its' children. 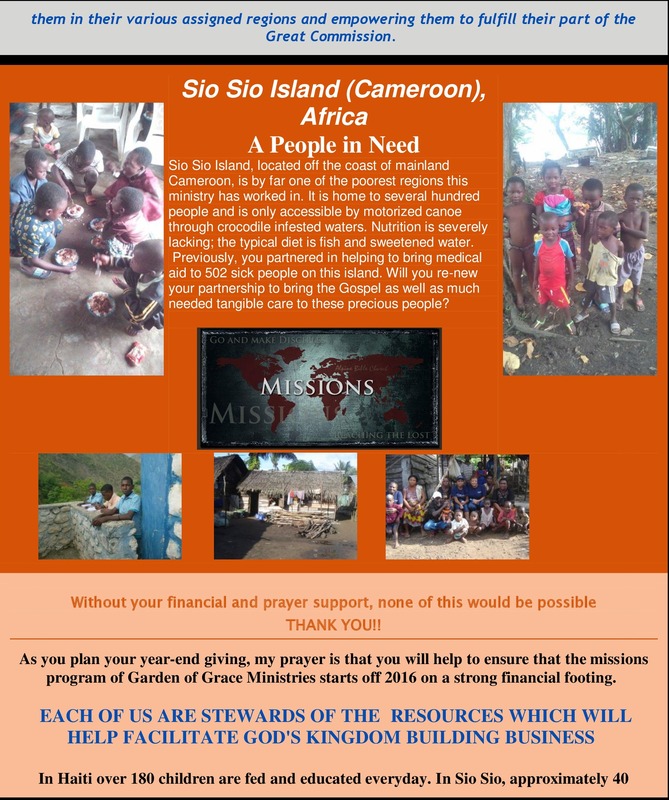 Your financial support of this initiative is greatly appreciated. 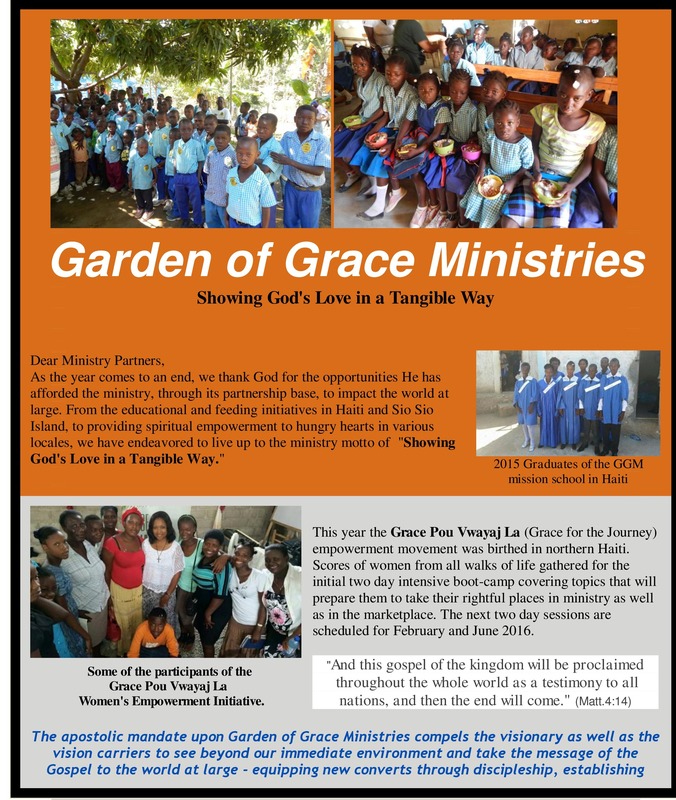 In addition to the on-going evangelistic outreach, Garden of Grace Ministries is actively engaged in the discipleship of new believers on this tiny island off the coast of Haiti. Through the utilization of various creative outlets, we are developing this new army to take its' place in God's kingdom, teaching them the precepts which He has established for us to live by. We are currently in the process of introducing 24/7 Christian programming with the help of the Trinity Broadcasting Network (TBN). 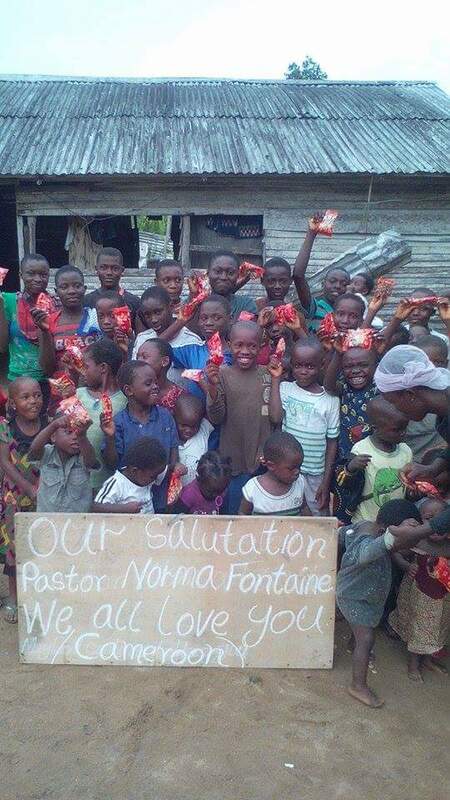 Satellite dishes for this initiative will be installed in the near future, thus enabling the local ministry team to facilitate a medium for the perpetual infiltration of the Gospel. 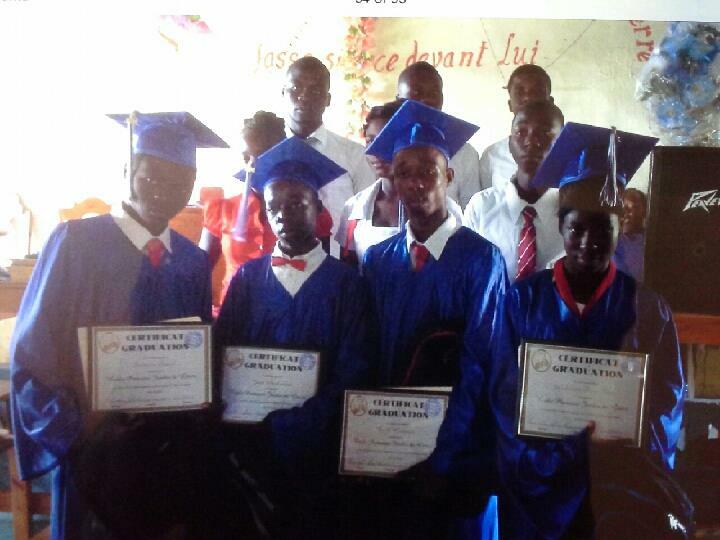 GGM is involved in shaping the socio-economic structure of these two communities in Haiti. With the planting of some 100 breadfruit trees a few years ago, the residents of Belle-Fontaine now enjoy a bountiful harvest of breadfruit. Most recently, the introduction of banana farming will pave the way for and promote self-sufficiency of these precious people.